SIG 510-1 automatic rifle. s# 5464 on crossguard. Excellent bright double edged stainless steel blade with only a serial number on the crossguard. Blackened steel pommel and one piece cilindric black plastic grip. Press catch on both sides. Stainless steel symatric crosguard with muzzle ring MRD 22 mm. Black plastic scabbard with no edges. 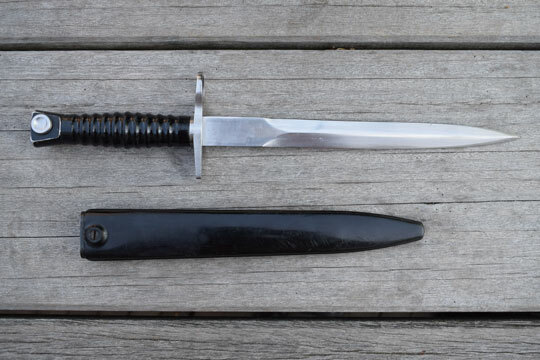 Bayonet and scabbard differ in dimensions and details from the Swiss Sig M 1957 bayonet. Rare bayonet and seldom found. Made for Chili in Switserland by SIG and in Italy by Beretta. Only 14.000 were produced in 1962-63.